Forged black iron wall lantern and tin lamp sconce style is based on Spanish designs. Many rustic wall lamps were created long time ago in Europe and with conquest of Americas introduced to Mexico. It was a colonial period that influenced the outdoor and indoor forged iron lighting character. 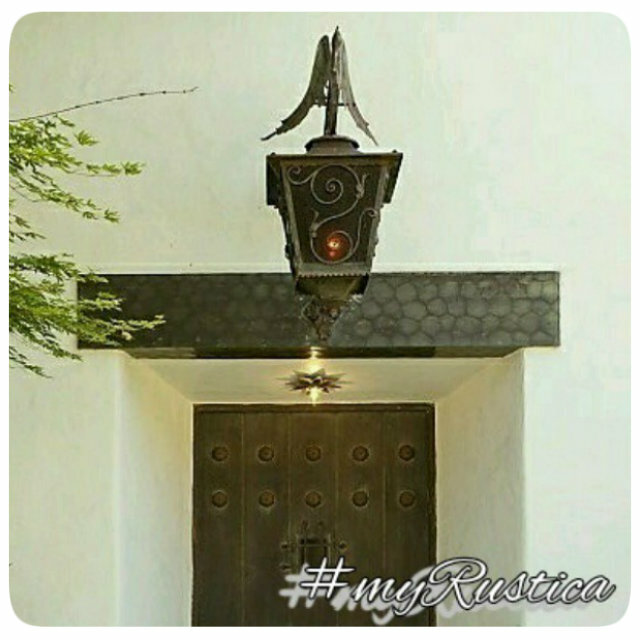 Rustica House illumination fixtures are handmade of forged iron in Mexican state of Jalisco and Guanajuato. Our wall mount lanterns come in many designer shapes and sizes. Standard dimensions shown on the lantern or sconce pages are the most common. You are welcome to buy any wall lighting in custom size as made to order. For finishing we use rustic looking oxidized metal, natural unfinished and black iron. Production and delivery of tin lamps, sconces for house outside illumination takes a month.